I am a team leader in the environmental monitoring part of Head Office Operations. My team manage and deliver surface and groundwater water monitoring around England which provides the evidence used to make environmental decisions. I joined the Environment Agency (EA) in 2003 as a fisheries scientist and spent several years leading fisheries monitoring on the Thames and it’s southern tributaries. Being outside and hands on was wonderful but there comes a time when you are ready to move into an office and work more with data. I took an assignment in Head office Fisheries Policy which led me to a permanent fisheries role in Operations. Both roles were enjoyable and challenging. My work with the national eel groups was especially rewarding. Fisheries has historically been a male dominated industry but by the time I joined it the tide was already turning. As an active Chartered member of the Institute of Fisheries Management I’m pleased to see the gender split continuously improving in the fisheries world. I feel it is my duty as a more senior female scientist to proactively encourage and support women coming into fisheries so they never feel they don’t belong. 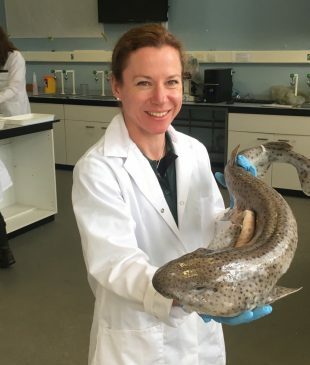 On 11th February I will be taking part in International Women and Girls in Science day by teaching a session on fish body shapes and adaption at my local primary school. I think it’s important for young girls to see women who are enthusiastic about science from an early age. If I am asked what I do for a job, I am always pleased and proud to say I am a scientist at the EA. However, this is certainly not where I intended to be at 40 years old. I have an Australian Masters degree in Tropical Marine Ecology and Fisheries Science. The 20 year old me intended to live in the developing world, helping local communities’ manage their marine resources. After settling in England, my priorities have changed. Working at the EA lets me combine being a mother and a scientist. I have two small boys and am married to another EA employee. Our flexible working and part time conditions are immensely valuable and give us the work life balance we need. Nice photo Katie! What's the curious beasty you are holding? Some type of dogfish or spurdog? Looks like a Bull Huss also known as a Nursehound.